Late last week, Google Earth updated satellite imagery that blogger and internet sleuth Curtis Melvin (via WSFJ) thinks could show the country's latest gulag. As the Wall Street Journal points out, there are six gulags in North Korea, not including this possible one. They are located in mountainous regions. Some are larger than major cities and house individuals who are deemed enemies of the state—as well as those who are simply related to those "traitors". 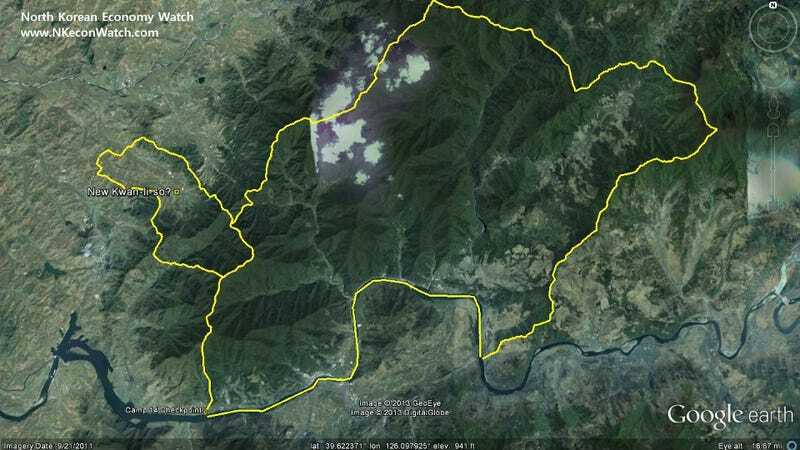 The newest satellite imagery is dated 2011-9-21, and shows what could be either the newest kwan-li-so (관리소) or prison camp. (That, or it could also be an expansion of an adjacent gulag, the infamous Camp 14.) Keep in mind, this is speculation—informed speculation on the part of Melvin. Melvin has spent years using Google Earth and firsthand accounts of visitors to North Korea in his effort to map the interior. You can read more about his efforts here. Below, see how the 2011-9-21 images compare with 2006 satellite pics (click to expand to full size). Images show what are believed to be guard posts and a security perimeter. This is believed to be the new camp entrance (latest picture on the bottom). This is believed to be the new camp interior (latest picture on the bottom).